Is your software vendor up to speed? Is it possible to estimate the project’s cost? As the October 1, 2013, implementation deadline for ICD-10 fast approaches, many hospitals and healthcare organizations are scrambling to ensure they’re ready to go. In the meantime, reports indicate there are still a lot of unknowns involved in the implementation process. Among those uncertainties are vendor readiness and predicting costs. While it may seem overwhelming, these issues can best be addressed with clear communication and early planning. 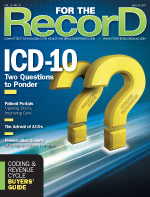 With a slew of changes looming on the coding horizon, hospitals must keep constant tabs on their transition to ICD-10. Vendor readiness is one of the bigger challenges confronting providers, with many reporting they are unaware whether their vendor is prepared to help with the transition. In fact, 55% of the chief information officers (CIOs) responding to a 2008 survey by the College of Healthcare Information Management Executives (CHIME) reported that vendor readiness and cooperation was their top concern in the ICD-10 conversion process. To help alleviate this potential pitfall, experts recommend providers maintain an open dialogue with vendors and fire a healthy dose of questions in their business partner’s direction. Of course, it would help if healthcare organizations knew their vendors. It may sound like a simple task, but for large organizations it’s not always cut-and-dried. ICD-10 has far-ranging effects, not the least of which are cost concerns. Forward-thinking healthcare providers would like to get an idea of how the transition will affect them financially. In the CHIME survey, short- and long-term budgeting was cited as the second most pressing concern, mentioned by 45% of CIO respondents.